Enneagram - Piedmont Physical Medicine & Rehabilitation, P.A. The Enneagram has evolved into a system of human development that maps nine different personality types and their interrelationships to the nine points of the symbol. Each type has developed an effective way of living in the world, and each differs in its world view and its placement of attention. People of each type have their own habits of behavior that may impact their choices and place limits on the possibilities available within their relationships, work, and self-development. 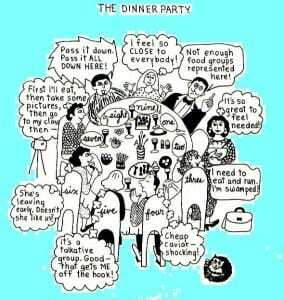 Each type has a different set of distinctive talents and traps of automatic behavior. Each has its own way of falling into imbalance and its own way of ascending to transcendent awakening. Although every human might have all the talents and traps of all nine patterns, each type is most compelled by, or specializes in, certain behaviors more than others. This then becomes an automatic way of being. One goal of the Enneagram system is to help us understand all types in order to better appreciate these differences in each other and reduce unnecessary conflicts. Through a study of the system, we can begin to gain a rich understanding of ourselves and the others in our lives. The study includes methods of self-observation that allow us to recognize our motivations and the patterns of attention that shape the personality in unique ways, as well as the many areas we humans have in common. It enables us to relate to one another with understanding, compassion and effectiveness in a powerful way not previously experienced. It assists us in developing stronger relationships and more significant life commitments. The enhanced communication that results from a study of the Enneagram significantly reduces misunderstanding and confusion. Personality is that which appears as our type traits and our automatic, unconscious behaviors. In some ways, it is false, like wearing the mask of a “persona.” Essence is that aspect of our being that transcends our personality, carries a universal quality, and serves as our contact with the spiritual. It is our “true” face. Although the initial benefit of working with the Enneagram system will be in creating a world of love, work and relationships that has greater fulfillment and deeper satisfaction, the ultimate benefit is the reward of doing the spiritual work: uncovering our essence, our real self, and our connection to God as we know it. Thus the Enneagram system serves the sacred agenda of being one with all beings. The Enneagram symbol is a nine-pointed, star-like figure. The nine lines comprise a perfect triangle and a twisted hexagon contained within a circle. There is intrinsic meaning in the relationship between the parts of the figure and the whole. It forms the basis for an exploration of human evolution, including the evolution of consciousness and self-development. The actual ancient origin of the symbol is unknown. 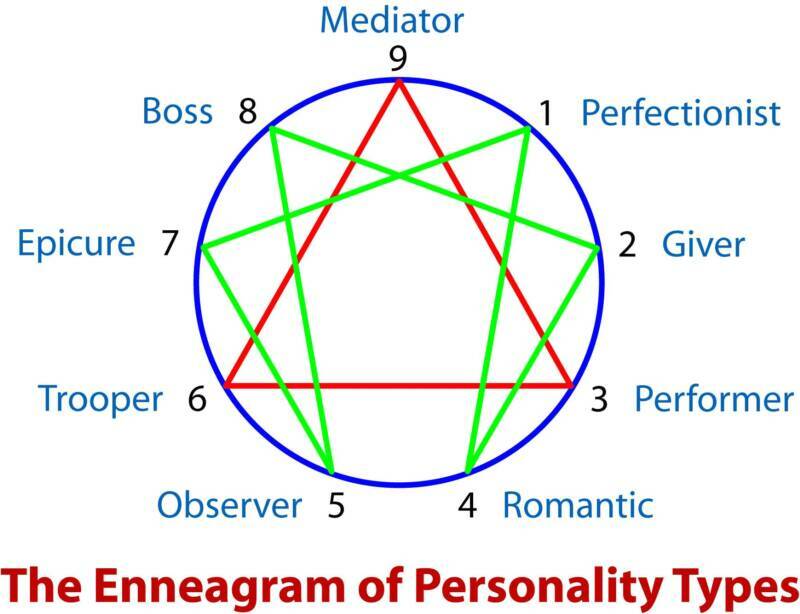 References to an Enneagram-like figure exist in many spiritual traditions. Recently, many have come to believe that it was known to the Sufis who used it as part of their mystical training practice. There are two major areas of scholarship dealing with the Enneagram. The first area, which we are concerned with here, concerns the psycho-spiritual aspects of our existence. It deals with the psychology of human personality and how that may be transformed into spiritual qualities. We call this the Enneagram of Personality. An important aspect of the symbol is the order in which the points, or personality types, are situated. The personality types that are next to another are called wings. While everyone can have only one home base for their personality type, it is possible to lean toward one of the wings and therefore share some of the characteristics of that wing. A second important aspect is where the lines connect. All personality types are allowed to travel along the lines toward a different personality type. Travel is limited, however, to the lines only. The lines depict which points of the Enneagram are connected.